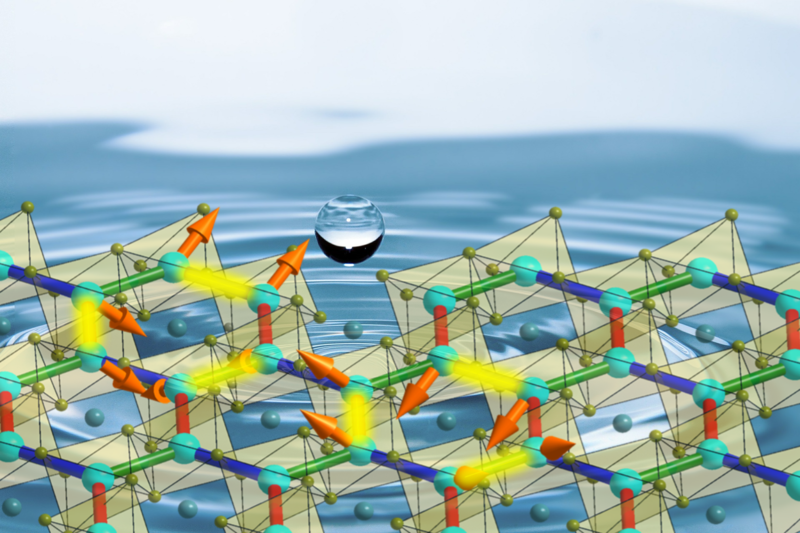 An international team of scientists from the University of Tokyo, Max Planck Institute for Solid State Research and the University of Stuttgart have experimentally observed an exotic quantum state of matter: a spin-orbital-entangled quantum liquid formed by iridium magnetic moments on a honeycomb lattice in the compound H3LiIr2O6. The iridium moments do not exhibit any type of magnetic ordering and remain quantum disordered down to very low temperatures compared to the strength of their pairwise interactions. Instead, the iridium moments liquefy into a highly entangled, quantum, spin-liquid state involving not only spins but also orbital moments of iridium electrons. A permanent magnet produces a persistent magnetic field generated by the cooperative, long-range-ordered alignment of the microscopic magnetic moments (the spins) of individual electrons in solids. Such a magnetic state is formed via a phase transition from a paramagnetic state of the thermally disordered, uncorrelated spins to an ordered state with a lower, spontaneously broken symmetry. The entropy associated with the possible directions of spins is released at the phase transition, giving rise to singularities in the thermodynamic observables. Such singularities are routinely detected through the measurements of the specific heat, magnetic susceptibility, and other physical observables. The actual patterns formed by electron spins can be identified, for example, by neutron scattering and nuclear magnetic resonance experiments. These ordered states of the microscopic moments range from collinear (spins aligned parallel) ferromagnets or antiferromagnets to more complex patterns such as magnetic spirals. Condensed matter physicists have long been dreaming of a very different collective quantum state of electron spins: one without any ordered pattern and therefore without any symmetry breaking down to absolute zero temperature. In essence, the spin analogue of liquid helium, which doesn’t solidify at ambient pressure due to large quantum effects associated with its light mass. In quantum spin liquids (QSLs), individual electron spins form a correlated, macroscopically-nondegenerate ground state through quantum effects, which hinder long-range magnetic order. Upon lowering the temperature, the magnetic entropy in a QSL gets smoothly released through the formation of long-range quantum entanglement between individual spins without causing any singularities in thermodynamic observables. This points to an important problem: how to detect a QSL? While its properties are fundamentally different from those of a paramagnet of uncorrelated, thermally-disordered spins, its characteristic features—long-range entanglement and non-trivial topological properties—are hidden to conventional probes of magnetism. For example, in nuclear magnetic resonance experiments a QSL looks identical to a paramagnet, since in both cases there are no static magnetic moments to split and broaden the peaks. Furthermore, a QSL has a very unusual excitation spectrum composed of fractionalized quasiparticles, leading to a weak, ‘smeared out’ response to scattering experiments. In many ways, a QSL is analogous to ‘nothingness’ in the school of Zen. The most celebrated theoretical example of a QSL is found in the exactly soluble Kitaev model, which describes spin-one-half moments on a honeycomb lattice coupled by bond-dependent anisotropic interactions of Ising-type. Each of the three types of bonds (forming 120o angle among each other) hosts an Ising coupling, which favours aligning the pair of spins along either the x, y, or z cubic directions. These three highly anisotropic, pair-wise interactions are frustrated, meaning they compete with each other, and the result is that quantum fluctuations drive the formation of a QSL. The fractionalised excitations associated with this particular QSL are Majorana fermions, which come in two flavours, one with a Dirac dispersion and the other being immobile. A proposal on the possible relevance of this apparently ‘toy’ model to the late transition metal compounds with spin-orbital entangled magnetic moments has triggered a huge interest in the search for an experimental realisation of the Kitaev QSL in materials. All of the candidate compounds synthesised so far, including honeycomb-lattice iridates and ruthenates, such as Li2IrO3, have turned out to be magnetically ordered at low temperatures. That is to say, ‘nothingness’ appears to be absent. However, strong experimental indications have been found, showing that these compounds are close to realising a Kitaev QSL. In the current study, the research group from the University of Tokyo (Kentaro Kitagawa), Max Planck Institute for Solid State Research (Tomohiro Takayama, Yosuke Matsumoto, Sebastian Bette and Robert Dinnebier) and the University of Stuttgart (George Jackeli), led by Professor Hidenori Takagi at the Graduate School of Science, the University of Tokyo, created a new honeycomb iridium compound, H3LiIr2O6, with the aim of realising a QSL. Using a soft-chemistry technique, the Li+ ions, in the buffer layer of the parent compound Li2IrO3, were replaced with H+ ions (protons). Unlike the parent compound, H3LiIr2O6 does not show any sign of magnetic ordering in the magnetic susceptibility, specific heat and, most importantly, nuclear magnetic resonance experiments. The complex spiral magnetic order of the parent compound of Li2IrO3 was replaced by ‘nothingness’ in H3LiIr2O6. This ‘nothingness’ is the long-sought QSL, involving not only the spins but also the orbital moments of the iridium electrons, with physical properties that might be akin to the Kitaev QSL. Figure: Spin-orbital quantum liquid on honeycomb lattice realized in H3LiIr2O6.